I'm not sure if you've caught onto this or not, but I LOVE cables. I really, really do. I simply cannot get enough of them! You probably wouldn't be able to tell that considering that the last string of FOs consisted of mainly straight up stockinette projects, but believe me when I say that I have an infinite love for cables. I don't know what it is about cables, but I just can't seem to resist them...they are just so much fun to knit and once I get going, I just can't seem to stop. They're just SO addicting! And every time I finish a project that features cables, I always get this feeling of great satisfaction...and for some reason, I always feel oh so clever. Tell me I'm not the only one! I have to admit though, as strong as my love is for cables, I've only really dipped my toes in simple cable work. You know, an 8-stitch horseshoe there, a lacy cable accent there...but nothing too intricate. I've always wanted to dive into a project that consists of heavy duty cable work, something that has cables as the main part of the fabric...not just as a design feature. But I've always held off. I don't know, I think it's because I just don't get the chance (or the time!) where I can sit for a huge amount of time to fully delve and immerse myself in all the charts that are usually involved in something a lot more complicated that I'm used too. I'll admit that my mommy brain was too scared to undertake a project that would require me to actually think and pay attention. I hemmed and hawed and still couldn't make up my mind if I should just dive head first into a project chock-full of cables. Then I got a sign. A few weeks ago I got the wonderful opportunity to become part of Carol Feller's blog tour for her new Craftsy class, Celtic Cables! I am so extremely excited and über happy to be a part of this blog tour, and am thrilled to bits to be the second stop of the tour! But can I make a confession here? For the longest time I didn't really understand what Craftsy was all about. I knew they offered online classes and workshops for various kinds of crafts, helped promote indie designers, showcased craft projects of all kinds, and offered deals on yarns and fabrics. But I didn't really understand what Craftsy was all about. I just didn't get it. 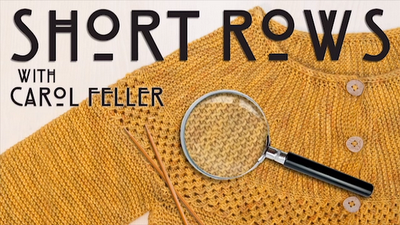 Before I became a part of the Celtic Cables Blog Tour, I took a good look around Craftsy and found Carol Feller's free mini-class, Short Rows. I signed up and after 10 minutes into the class I got it. I'm still in awe of how amazing Craftsy's platform is! In that first 10 minutes I was able to watch the first 5 minutes uninterrupted before the Munchkin puttered over to see what I was up to. I was able to stop the class, make the Munchkin a snack, come back and continue on watching the class where I had left off! Amazeballs. Just when I thought I was already getting lost in the class, I looked over at the side bar and noticed that another knitter had asked the very same question that I was thinking! Yup. Awesomeness. And now getting the chance to review Carol's Celtic Cables class on Craftsy? Double awesomeness. When I started watching Celtic Cables I really wasn't quite sure what to expect, mainly because I've never taken a proper knitting class before. I couldn't believe all the topics that Carol touched on and was simply amazed as to how thorough she was on each subject. And the best part of the class (aside from gaining a lot of knitterly knowledge)? 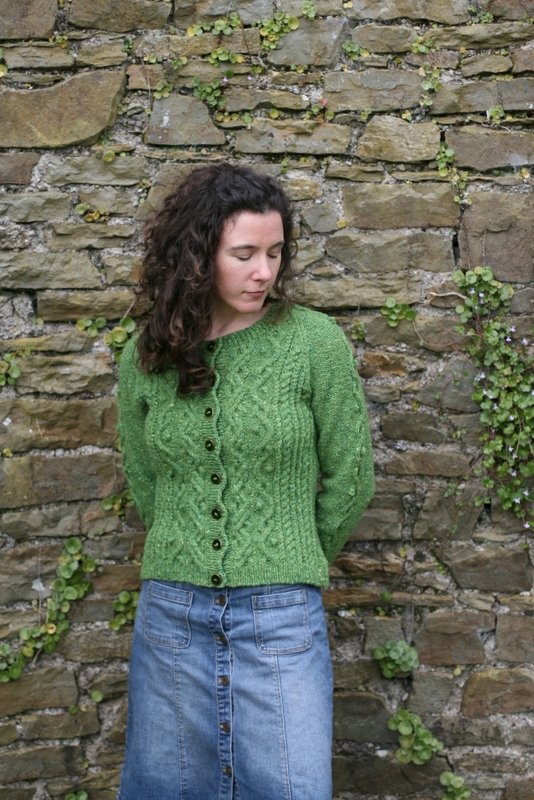 You can walk away with a beautiful cardigan full of celtic cable yumminess by the end of the course! Gorgeous, right? You can knit that. You can! In the Celtic Cables class Carol will show you step-by-step just how to knit your very own custom fit Portulaca cardigan. Containing well over 6 hours of knitterly instruction (and yes, I watched every single second. It was great!) Carol will start out the class by talking you through and showing you how to properly measure your body and explains the difference between actual measurements and garment ease - which is great for beginners and knitters who are trying their hand at knitting a garment for themselves for the first time. Carol will then teach you about gauge and why you need to knit a swatch for each cable section. Don't worry if you've never knit a cable before, Carol will show you how to read and follow charts, how to block cabled work, and how to knit all the different cables that are featured in the Portulaca cardigan! I absolutely LOVED how the video displays the row of the cable pattern that Carol is knitting below the actual video and highlights each stitch that was being knit so that you can accurately follow along. Yay for visual learning! As if that wasn't awesome enough, Carol offers some fantastic tips of how to keep track of where you are in a chart and shows you how to knit with and without a cable needle, which truly excited me. I actually had to stop the class, grab some leftover yarn and needles and cast on a little swatch so that I could give it a try! I've knit quite a few cardigans in my knitting life and am still trying to figure out how to get my knits to fit properly. So it was right up my alley when Carol went into detail about pattern schematics and did a break down to show you how to get a custom fit. But if you're anything like me and aren't brave enough (yet!) and don't trust your knitterly math, don't worry, Carol also explains other ways of creating a better fit that won't have you re-calculating the entire pattern. I know I'll definitely be using this new found knowledge in future projects! Wow, can you believe this? So much valuable information already and we haven't even cast on yet for the actual cardigan! Speaking of cast ons, I learned a brand new way of how to cast on for when you start your garment with ribbing. I SO can't wait to try this new technique out on my next project! I also learned a bind off that I had never even heard about before. Is it weird to say that my jaw dropped when I watched Carol do this bind off? Cause it did. Another technique to add to my knitting bag of tricks! Again, I can't wait to try it out on a future project! As I continued to watch the rest of the class I started to feel like I was no longer taking an online course. Maybe it's Carol's soothing accent and relaxing tone of voice (if she was at all nervous, she really didn't show it!) or maybe it's because I was in the comforts of my own home with my feet up, knitting in my lap, and cup of tea beside me but after a while I felt like I was sitting with a friend who was guiding me on how to create a beautiful piece of wearable art. As you learn about shaping (waist, raglan, and neck), sleeves, button bands, and finishings, you'll also get some handy tips and explanations as to why Carol did things the way she did. I loved that. Sometimes when I knit a pattern I truly wonder why the designer chose this method over that one in how a garment is constructed. So I really liked the little tidbits of the designer's thought process. I also really appreciated the fact that Carol understood that no two knitters are alike and even though she gave explanations of the techniques she chose to use in her design, she constantly encourages you to experiment and to try out different methods to find out what works best for you so that you can "own your knitting" and personalize it even further. Heck, she even supports you to try different cable patterns and if you don't like one of the cables featured in Portulaca she shows you how to sub in a cable pattern that you do like into the cardigan instead! How awesome is that? Another thing that I love? That after each lesson Carol encourages you to ask questions, to leave comments, to post progress photos, to share your modifications, and most importantly to leave yourself little notes as to where you are in your knitting (or in the class). After all, we all know just how easy it is to get completely caught up in your knitting!! Just when you think the class is over and your cardigan is almost finished (I thought it was so cute that you can see and hear the excitement of the prospect of having a finished garment in Carol's voice at the end of the last lesson), you get an awesome "bonus" lesson on how to fix your mistakes in cables without having to rip up all your hard work and how to tighten up stitches around your cables and ribbing. An unmentioned bonus: the Portulaca pattern is currently only being offered through this class! You won't be able to find this pattern in any book or even Ravelry! What skill level does a knitter need in order to take the class? To do this class a knitter has to have a basic grasp of knitting (knit and purl), increasing, decreasing, and reading a pattern. However, the most important skill is patience and a little bit of fearlessness! I met a knitter recently whose first garment was a cabled cardigan from my book, Contemporary Irish Knits and she had no problems! You do of course, need the basics but if you're willing to take your time and possibly watch the trickier sections a few times on the video, then I really believe that this is something most knitters can tackle! 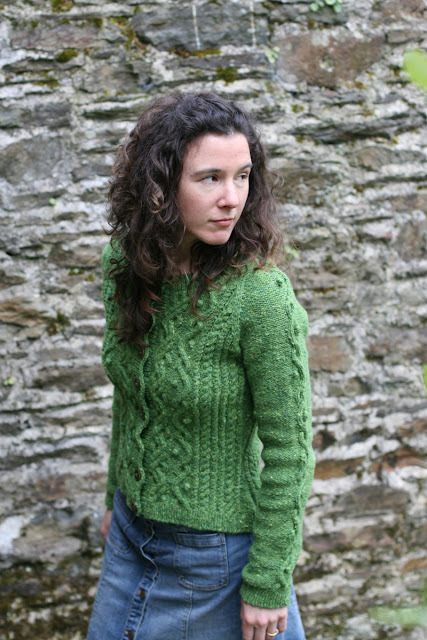 Miso Crafty Knits Note: If you haven't checked out Contemporary Irish Knits yet, you must! So many delicious cables all jammed into one book...I seriously want to knit every pattern! What would you like knitters to know about your class? I really enjoy knitting cables and I hope this love of cabled knitting transfers through in my online class. I've packed a lot of information into the 12 lessons of this class and it will probably be necessary for newer knitters to watch some sections several times. That has to be one of the best things about the Craftsy platform, because the videos are online you watch them any time, on any computer as often as you'd like. Also, the classes are fully interactive, you just write a comment at a particular place on the video and either I or other knitters can reply. If there's a particular place in the video that you need more explanation on you only need to ask! What do you hope knitters will gain from your class (such as a better understanding of cables, how to incorporate cables into their knitting, etc)? There are a few key skills that I hope knitters will take away from this class. The first skill set relegates to cables. In the class knitters will work through the basics of cables, reading a cable chart, the mechanics of actually working a cable, and how to correct mis-crossed cables. The second set of skills deals with knitting a garment that fits. Knitters will learn how to measure themselves as accurately as possible and knit their gauge swatches. With the body measurements and swatches done knitters will use the schematic as a guide to figure out what, if any, modifications they'll need to make to get the best fit possible. Doing all this by yourself for the first time can be intimidating but having a class situation that you work at your own pace makes learning cables and fitting your cardigan much more manageable and fun! If you're itching to learn how to knit cables or want to learn how to knit your first cardigan, I highly recommend this class. Interested? 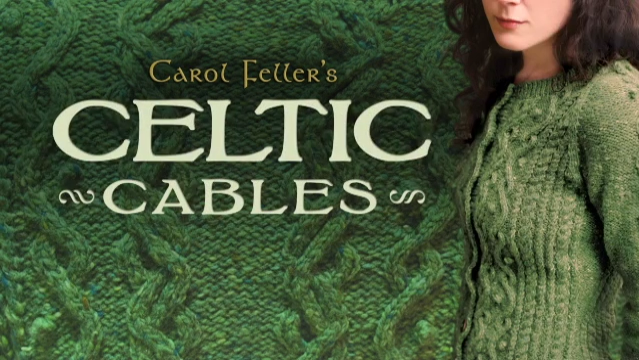 Sign up for Carol Feller's Celtic Cables class and you'll get the class for 33% off by either clicking on the banner above or by using this link. Seriously, that makes this course only $28. That's not even $5 an hour! And that's including the price of the pattern! What a steal! Sign up, you won't regret it. And if you do take the class, please, come back here and let me know what you think! I just might grab this class too. It's sounds awesome!! I definitely recommend this class, so many useful tips! I've really been wondering about the Craftsy classes - they seem really interesting, but I just wasn't sure if they were worth the money. I'll definitely be adding them to my wishlist, especially the 'Fit Your Knits' and 'Celtic Cables' ones. I wasn't quite sure either until I checked out some of the freebies and did a break down of how much they really would cost me. When I think about buying a book, taking a class in person, or even trying to find info online, I say these classes are definitely worth the money! Especially if it's on a topic that you know nothing about. Everything about the Craftsy platform definitely makes it worth it! I say check out some of the freebies first to see for yourself if it's up your alley. Great review. I've been wanting to know more about these Craftsy classes and I'm too slow of a learner to take a class through my LYS. Thank you for the discount as well! Wish I had true high speed, not the quasi-high speed that we have here. Any videos I view are very frustrating waiting for them to load. Some day, hopefully, we will have high speed and I can take these classes.